Millions of people sit at their desks in the office or at home every day, often for many hours at time. Yet many also do so in an imperfect position, applying undue and improper stress and pressure on the body for prolonged periods of time without realising it. RSI, sore backs, achy shoulders, fuzzy hands, thumping headaches are just some of the most common and immediate symptoms you may have experienced at some point.Bad habits and incorrect posture lead to short term aches and pains in the back or neck, as well as upper limb problems such as tennis elbow or shoulder tendinitis. Unchecked, these short-term aches can turn into profound longer term injury that can substantially impact daily life and consequently take much longer to recover from.The perfect workstation position allows all the body’s joints to be aligned in a neutral position, therefore avoiding static or awkward posture, repetitive motion, unnecessary leading forwards or bending down, or unnecessary gripping of equipment.Workstation ergonomics can be extended to consider your home environment also. 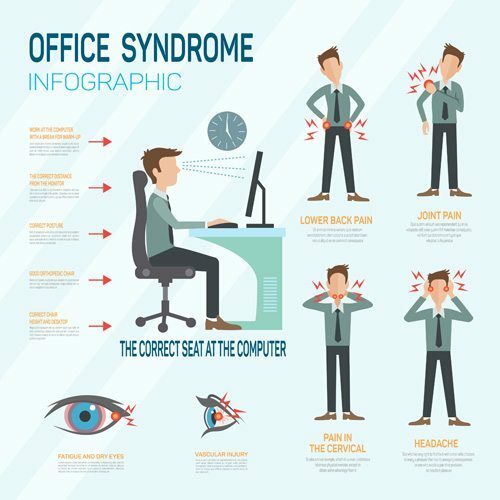 If you sit frequently on the sofa or in bed using computers or digital devices, or if you drive long distances very frequently, then you are again placing unnatural pressure on joints within the body that overtime can lead to Gradual Onset injury. Physiotherapists are specialised in understanding the bio-mechanics of the body, quickly identifying the risk factors and eliminating them before they cause injury. Through discussing your needs, medical history and an analysis of posture and working requirements, a physiotherapist will make recommendations and adjustments to equipment (eg: a new mouse), seating (often as simple as adjusting height), desks or even computer software to optimise your working experience.This is most effectively done at your desk or “on location”, therefore showing you the necessary adjustments in situ, ensuring correct set up then and there and so you can get on with what you need to do, comfortably and healthily. Firstly, we will come to you, discuss your needs and lifestyle, assess any residual or early injury or discomfort that you may already have and then assess the broader environment. We will then set up your workstation or home environment taking into account your individual needs, and show you a few simple checks and tests that you can also do your self to ensure that you retain a healthy position in the long term. Posture is key but movement is essential… Keep moving to compensate your sedentary lifestyle.